I have a soft spot for this style of steak sandwich, the non-sliced, non-minced, just-a-plain-old-steak-on-a-roll steak sandwich. I’ve featured one here before, and while this one came with a bit more than that one, it was still fairly plain. 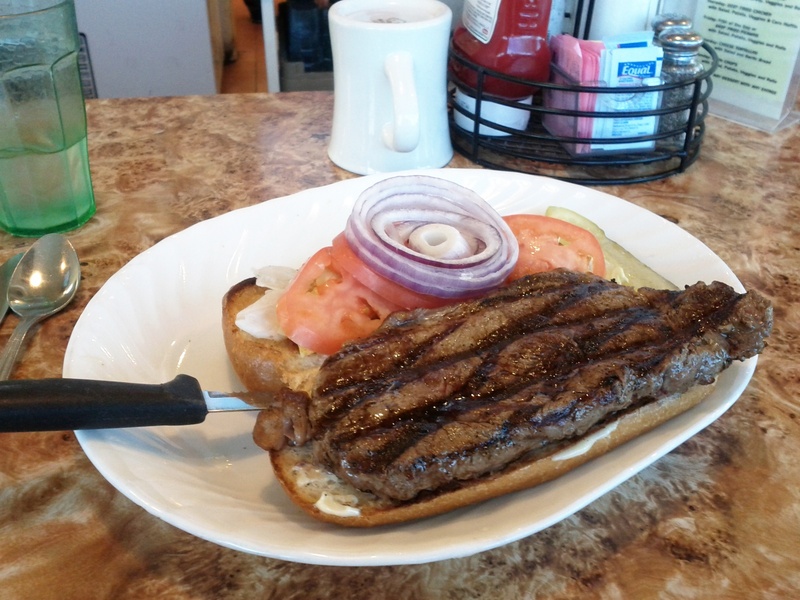 A NY strip steak, lettuce, tomato, red onion, and mayonnaise. The steak was well cooked, tender and juicy. Sadly, that’s about as much good as I can say about this sandwich. I can deal with a plain steak sandwich. The steak may have been well cooked, but it was bland as the dickens, and I’m not asking for much. I’m not asking for mushrooms sauteed in a burgundy sauce, I’m not asking for a roasted garlic herb butter, I’m not asking for whole grain mustard, and apple compote. You want to serve me a steak on a bun, that’s fine. But for crying out loud, throw a little salt and pepper in there. It’s a stunning mistake, really. How on earth does this happen? Is this not a professional establishment? Don’t they cook things regularly, and know what makes things good? Never mind all that, are they not human beings? Do they not eat, do they not taste? What excuse could there possibly be here? The Roman Empire has long since gone to its grave; these days there’s plenty to go around. Spare some for my steak, please. As for the rest of it, the lettuce was iceberg, the tomatoes standard hothouse mush, and the red onion sadly sparse. I take no issue with plain, have no grudge against simple. Lackadaisical, though, careless, well that’s another matter entirely. This entry was posted in Sandwich Reviews and tagged Beef, Reviews by Pete, San Jose, Sandwiches I Have Eaten, Sandwiches Made For Me by Pete. Bookmark the permalink.